As the final rounds of Whistlemania begin, we start to get into the real tests of performance, those of distance, and this week’s test is for all the water lovers out there. If you follow Survival Weekly on this blog, you have probably noticed more water rescues and fatalities as the weather warmed up. Common sense dictates that when it gets hot, more of us like to cool of in the water or play on it. Most fatalities are from drowning, so wearing a lifejacket is your best plan and ataching a whistle to said lifejacket may aid in a timely rescue. Test: Paddle out to known distances and by the process of elimination, determine the maximum ranges for the whistles. Distances were determined by GPS and tests were done at 1/4 mile, 1/2 mile, 3/4 mile, and 1 mile. The conditions were sunny with a high temp of 87 degrees. Initially, the was a breeze blowing towards the observers, but conditions during the 1/2 mile to 1 mile tests were calm. Ambient noise from birds, locusts, and waves was present and tests were temporarily stopped to allow for boat traffic to pass. The observers were positioned on the point of a peninsula that extends halfway across Calderwood Lake for their listening post and were asked to comment via radio if the whistle could be heard and if it could be confused with other noises. Three blasts of each whistle were done at each distance until a couple of kayakers appeared out of nowhere to rescue me. After that, I switched to two blasts and each whistle was given a second chance at the distance it failed. Below is a picture of the test site with the orange arrow being the observers a mile away. 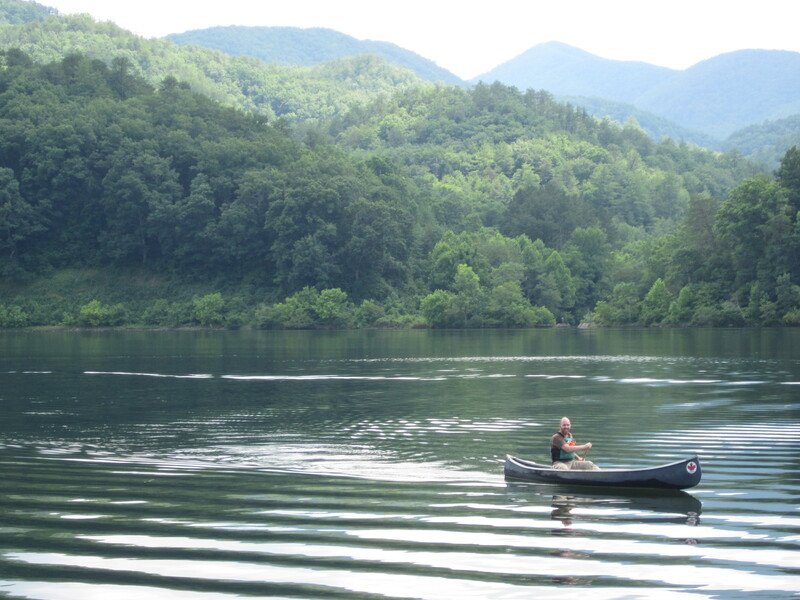 Our lakes in the mountains are narrow and long, so the possibility of sound funneling can be addressed by someone smarter than me in the comment section if you wish. The observers: Special thanks goes to Brian and Laura Osgood, Sierra McAllister, and Dr. Ken Miller of the Blount County Rescue Squad. While patrolling Highway 129, a.k.a. The Dragon’s Tail, I managed to catch them in some down time and they were happy to wade into the melee of rescue whistles. These are real world rescuers and this team comprises a good mix of hearing ability. Dr. “Hunk” Miller, age 72, has significant high frequency hearing loss from years of shooting, military service, and women screaming about his good looks. He was wearing his hearing aids during the test, as he would on an actual incident. Sierra, age 18, like all young adults may be guilty of cranking up the tunes too loud, but as expected had the keenest ears. Brian and Laura, both in their mid 40’s, represented what we all considered to be the average hearing ability of a responder. I have had the pleasure to work with the BCRS professionals on several incidents on the Dragon’s Tail and one remote rescue in the park that required the use of their vessel and can’t say enough about their dedication, skill, and professionalism. Every year, BCRS provides nearly 32,000 lifesaving volunteer hours and consistently places in the top three in statewide rescue competitions. If you or anybody you love rides motorcycles or drives sports cars, these are the men and women that will be saving their lives on the Dragon if the unthinkable occurs. They do all this and more with a volunteer staff and relying solely on donations from the community for their operation!! 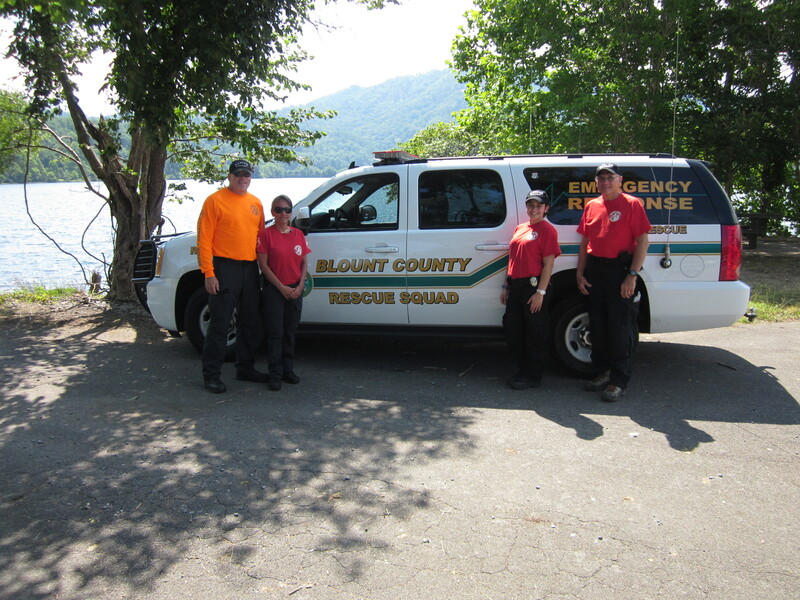 BigPig Outdoors would like to thank the Blount County Rescue Squad for their service in the community and their assistance in Whistlemania and has made a $150 donation to their organization as a token of our appreciation and will be teaching a free survival course for their staff this winter. If you, your family, or organization have found the information from Whistlemania valuable, I urge you to click on the link below and contribute any amount to their cause. 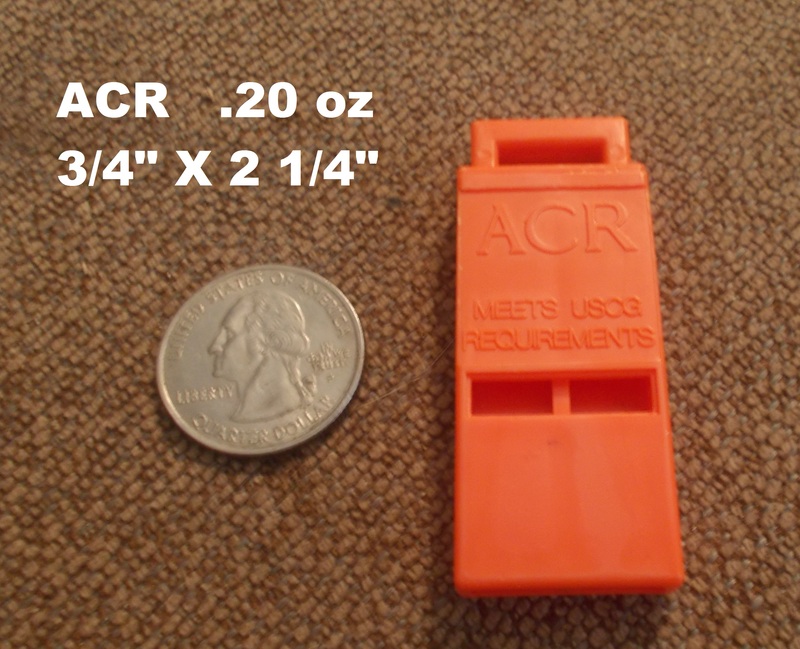 Even if you can only donate the price of an average whistle, it all helps. Well almost… Starting at 1/4 mile Doc Miller could not hear a majority of the whistles. To save typing, assume that Doc Miller didn’t hear any of them unless noted and that includes the 1/4 mile tests. “Heard up to” – Means that all three observers without hearing damage could hear it at that distance, unless noted differently. 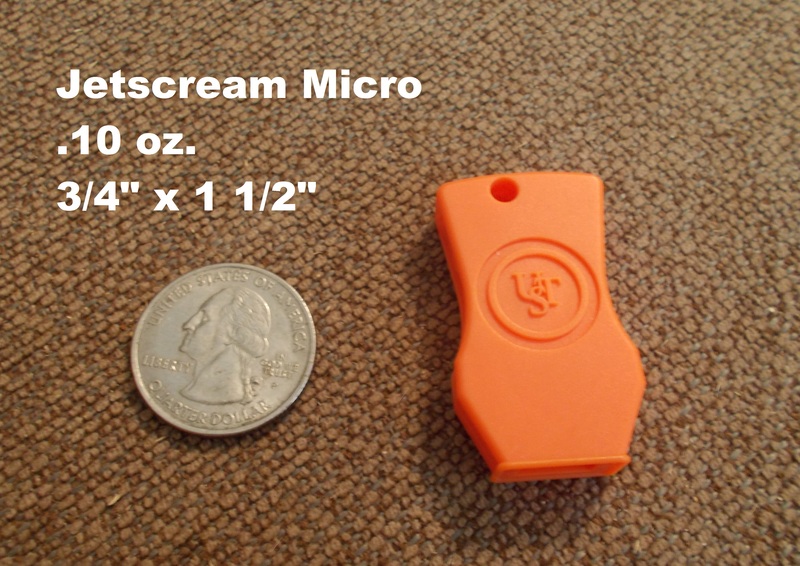 Jetscream Micro – Heard up to 1/2 mile. Failed at 3/4 mile. ACME 660 – Heard up to 3/4 mile. Failed at 1 mile. Fox 40 Classic – Heard up to 3/4 mile. Failed at 1 mile. 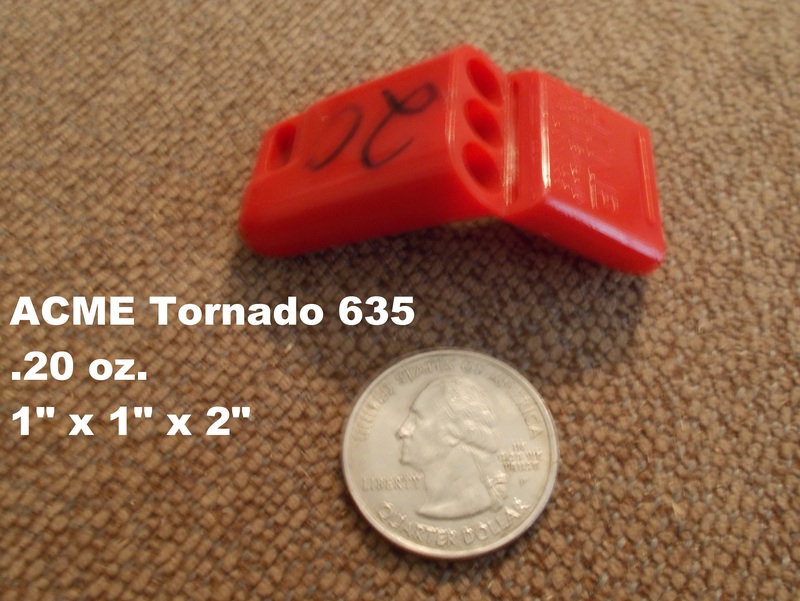 ACME Tornado 635 – Heard up to 3/4 mile. Observers commented that it could be confused with a car horn. Failed at 1 mile. Hammerhead – Heard up to 3/4 mile. Observers commented that sound was faint. Failed at 1 mile. Tin Whistle – Heard up to 3/4 mile. Observers commented that sound was faint and bird like. Failed at 1 mile. Fox 40 Mini – Heard up to 3/4 mile by 2 out of 3 observers. Failed at 1 mile. AMK or SOL or Fox 40 Micro – Heard up to 1/2 mile. Failed at 3/4 mile. ACME Tornado 636 – Heard up to 3/4 mile. Failed at 1 mile. 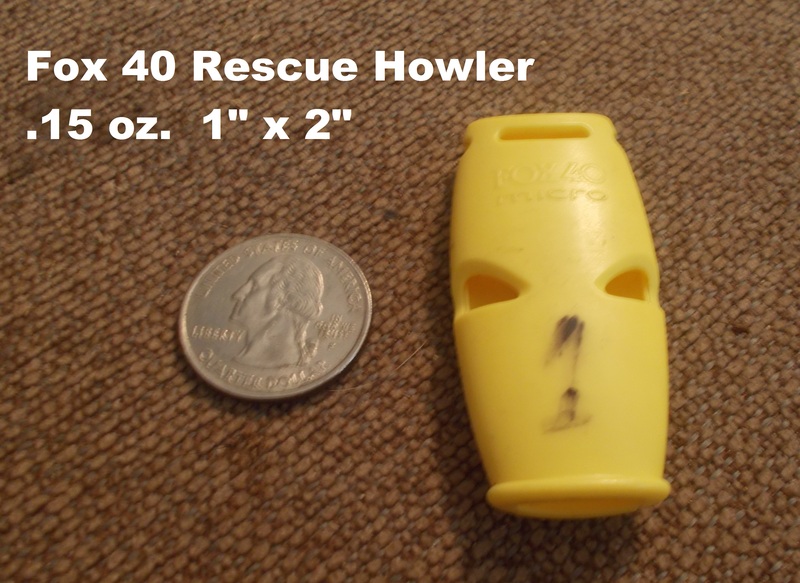 SOL Slim Rescue Howler – Heard up to 3/4 mile. Observers commented could be confused with bird. Failed at 1 mile. ACR – Heard up to 3/4 mile. Failed at 1 mile. Coghlan’s 5 in 1 Survival Aid – Heard up to 3/4 mile. Failed at 1 mile. 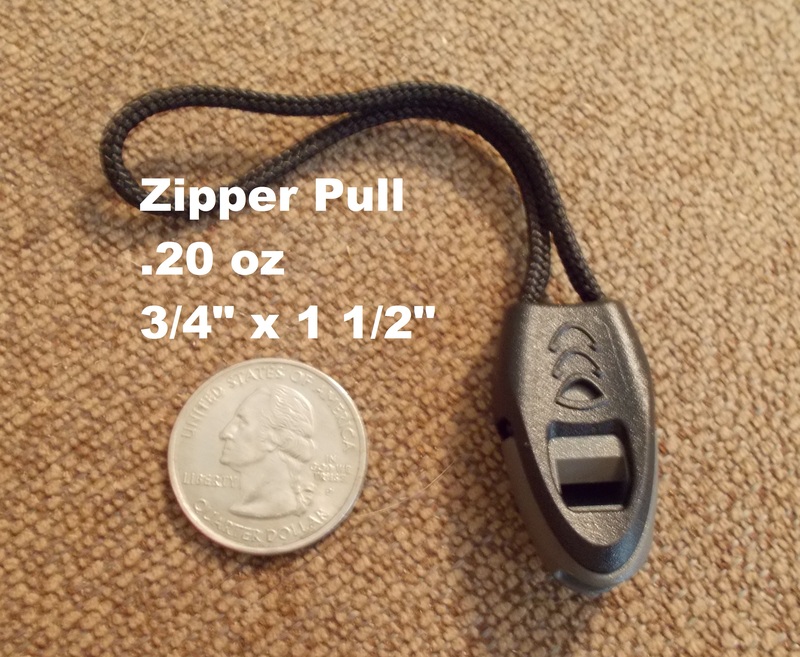 Zipper Pull Whistle – Heard up to 1/2 mile. Reported as faint. Failed at 3/4 mile. 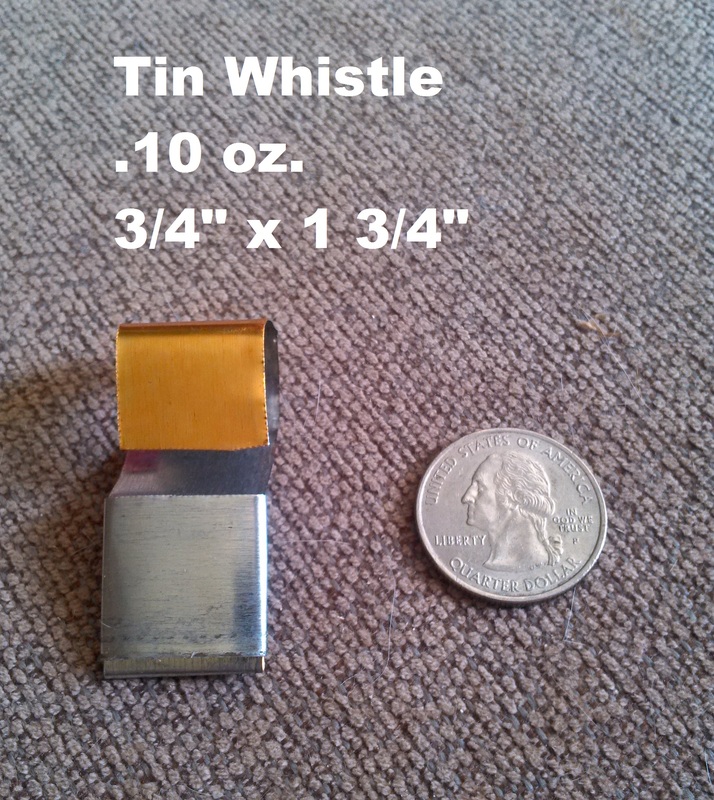 Coghlan’s 4 in 1 Whistle – Heard up to 3/4 mile. Reported as bird-like. Failed at 1 mile. Sternum Strap Whistle – Heard up to 1/2 mile. Reported as faint. Heard by 2 out of 3 at 3/4 mile. Failed at 1 mile. LMF Swedish Firesteel Army 2.0 – Heard up to 1/2 mile. Reported as faint and bird-like. Failed at 3/4 mile. Windstorm – Heard up to a mile. Rated as a 2 out of 3 on loudness at that distance. On several blows, the pea got temporarily stuck and required another blow to free up. 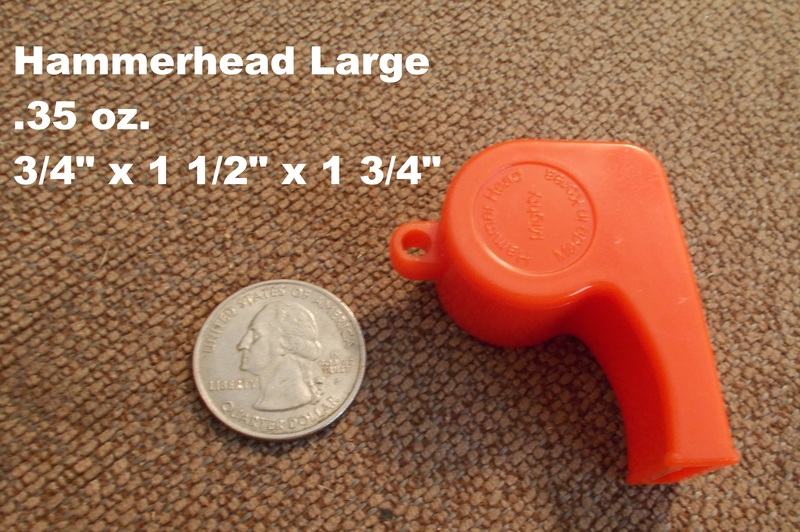 Hammerhead Mighty – Heard up to 3/4 mile. Failed at 1 mile. 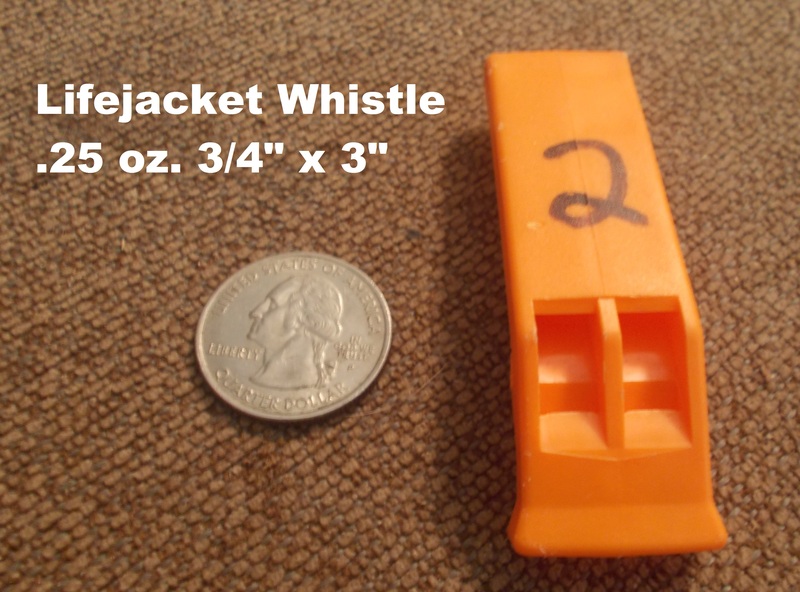 Lifejacket Whistle – Heard up to 3/4 mile including Doc Miller!! Heard at 1 mile by all except Doc. Rated at 1 mile as 2 out of 3 for loudness. FOX 40 Eclipse – Heard up to 3/4 mile. Failed at 1 mile. Storm – Heard up to 1 mile. Rated a 3 out of 3 for loudness. Doc Miller heard this one at 1/2 mile, but no further. On several blows, the pea got temporarily stuck and required another blow to free up. Scotty Lifesaver – Heard up to 3/4 mile. Reported as faint. Failed at 1 mile. 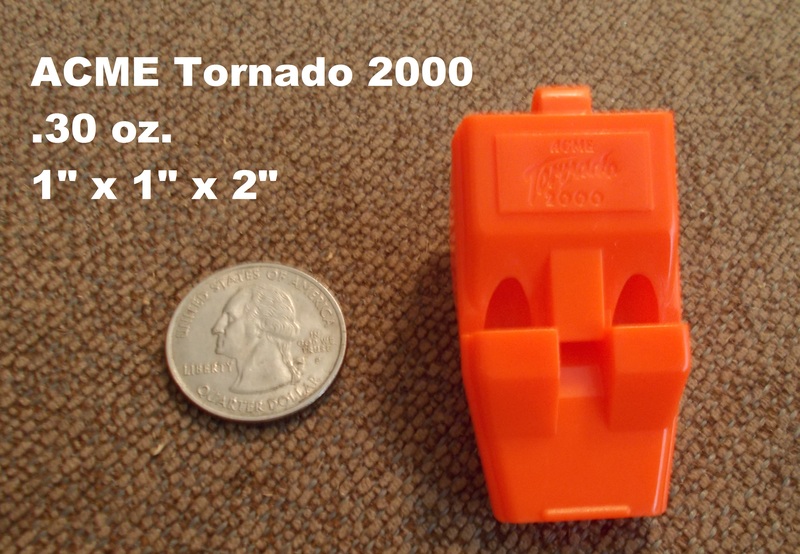 ACME Tornado 2000 – Heard up to 3/4 mile. Failed at 1 mile. 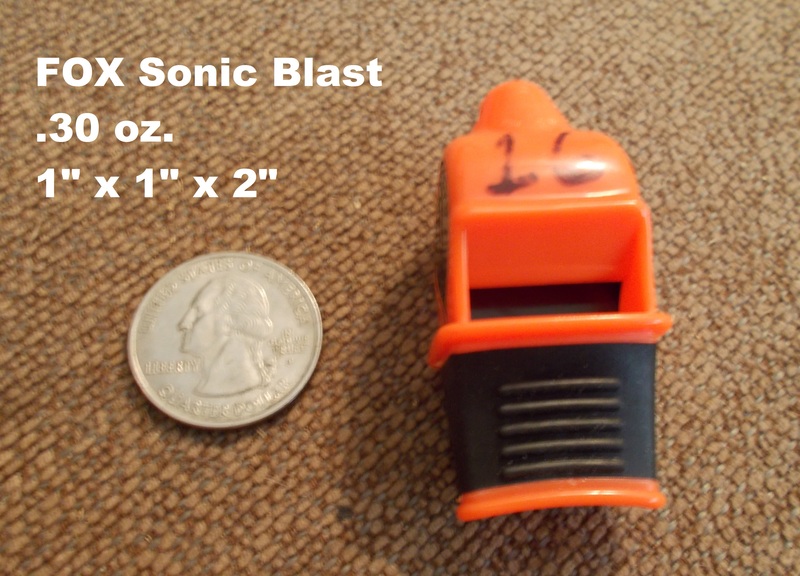 FOX 40 Sonic Blast – Heard up to 3/4 mile. Failed at 1 mile. 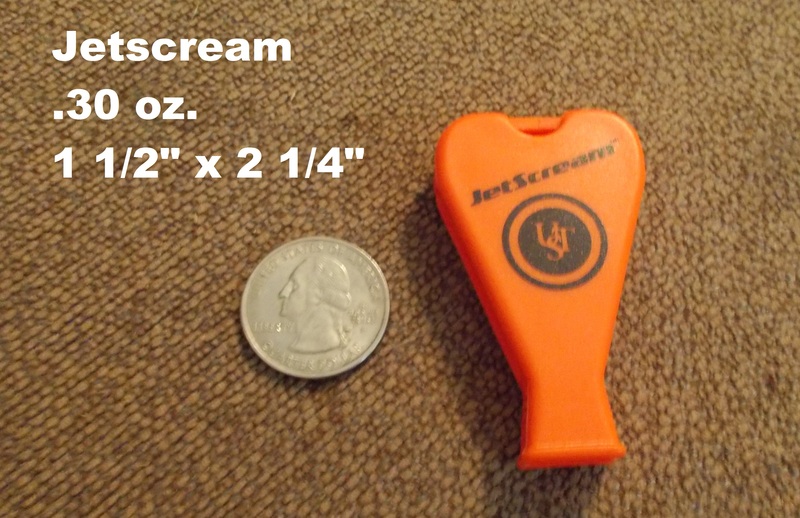 UST Jetscream – Heard up to 3/4 mile. Failed at 1 mile. 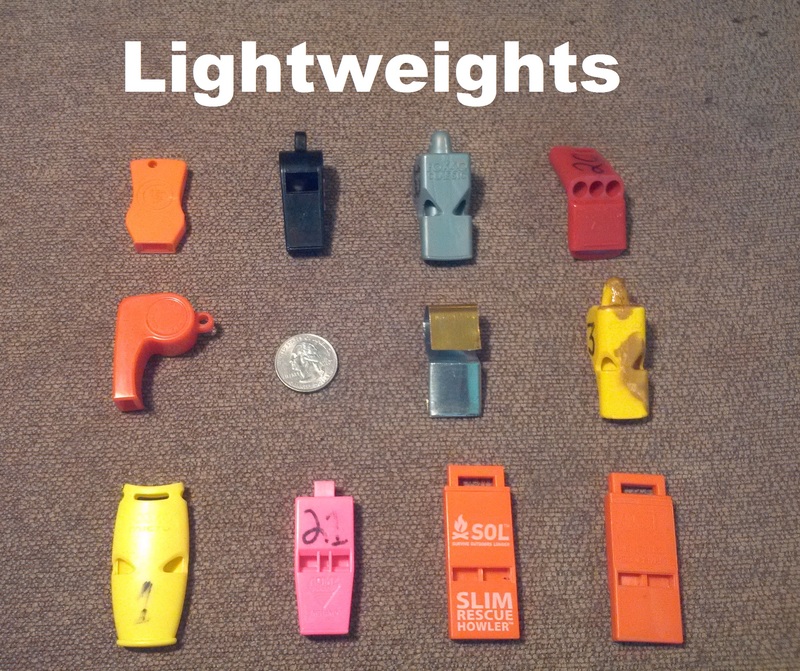 Whistles for Life – Heard up to 3/4 mile. Failed at 1 mile. 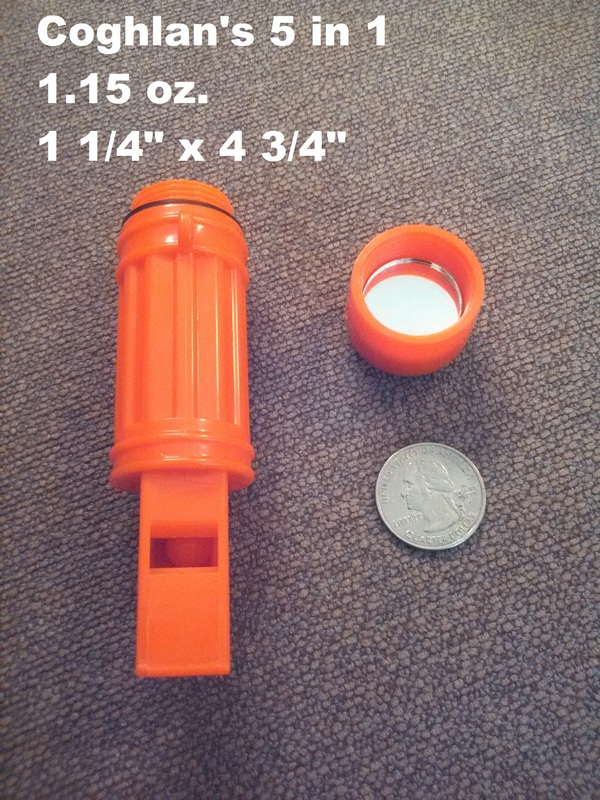 Promo whistle – Heard up to 3/4 mile by 2 out 3 observers. Reported that it sounded cow-like. Failed at 1 mile. 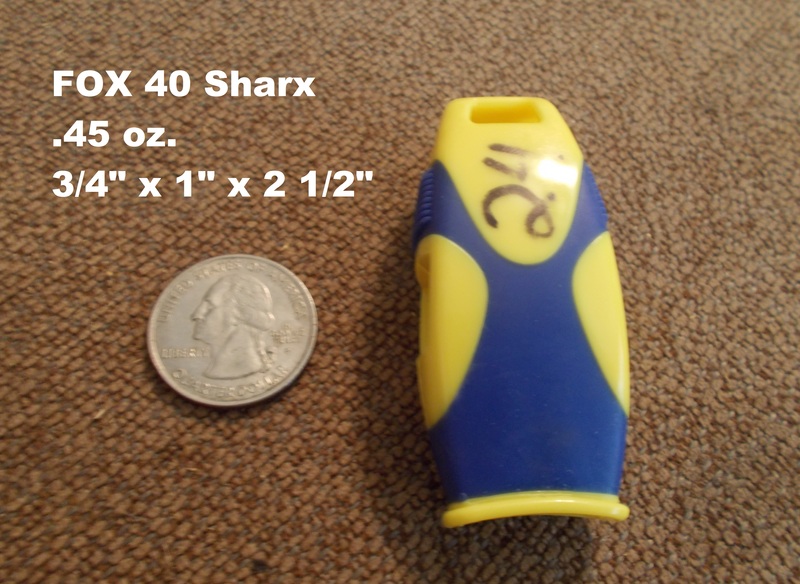 FOX 40 Sharx – Heard up to 3/4 mile. Failed at 1 mile. Doc Miller heard this one at 1/4 mile, but no further. 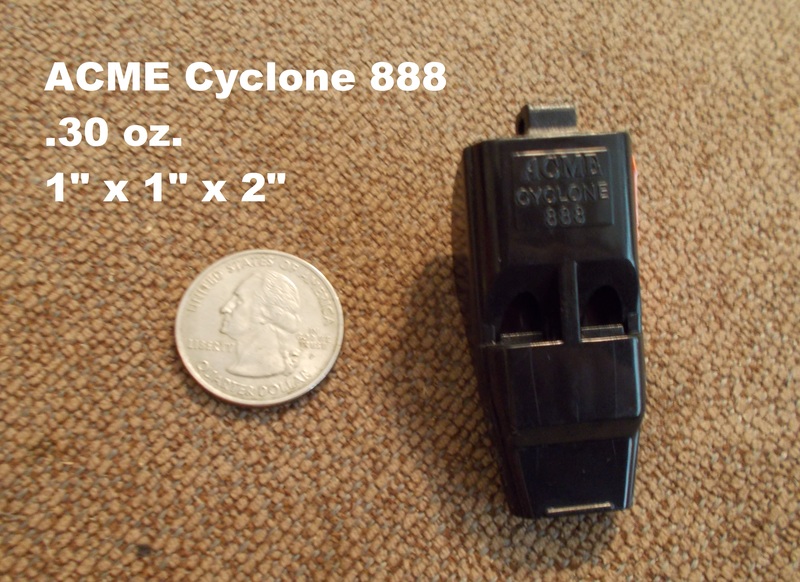 ACME Cyclone 888 – Heard up to 3/4 mile. Failed at 1 mile. ACME 649 – Heard up to 3/4 mile, including Doc Miller. Reported as being bird or horn like. Failed at 1 mile. I have done some unsanctioned testing during classes in the woods and the difference between open water and the woods is surprising. At a distance of 1 mile, all observers could hear me yell and stated it was louder than the whistle. My voice would have gone out if done repeatedly, but an occasional yell along with whistling is a good plan. 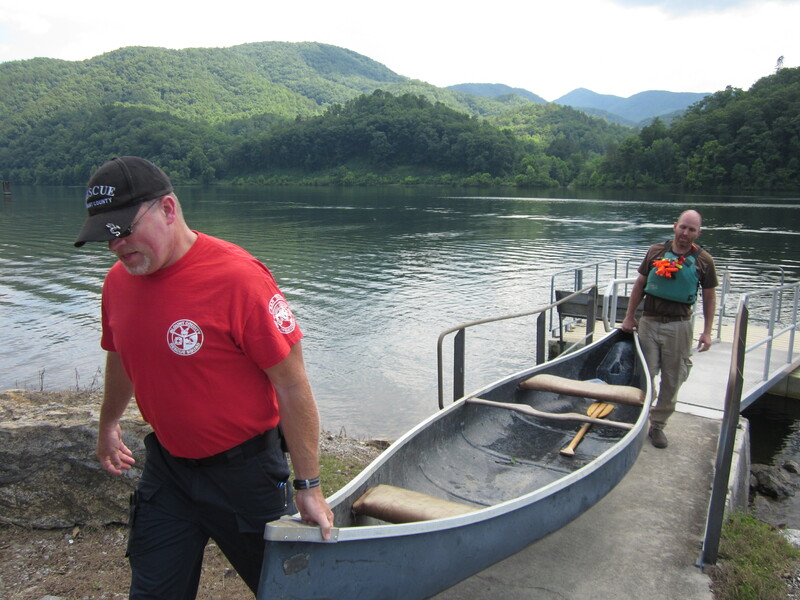 The average age of rangers in the Smokies and BCRS volunteers is in the mid-30’s. High frequency hearing loss often accompanies aging. Consideration needs to be given to the fact that a lot of our young veterans return with hearing damage and many serve among the ranks in Search and Rescue organizations. 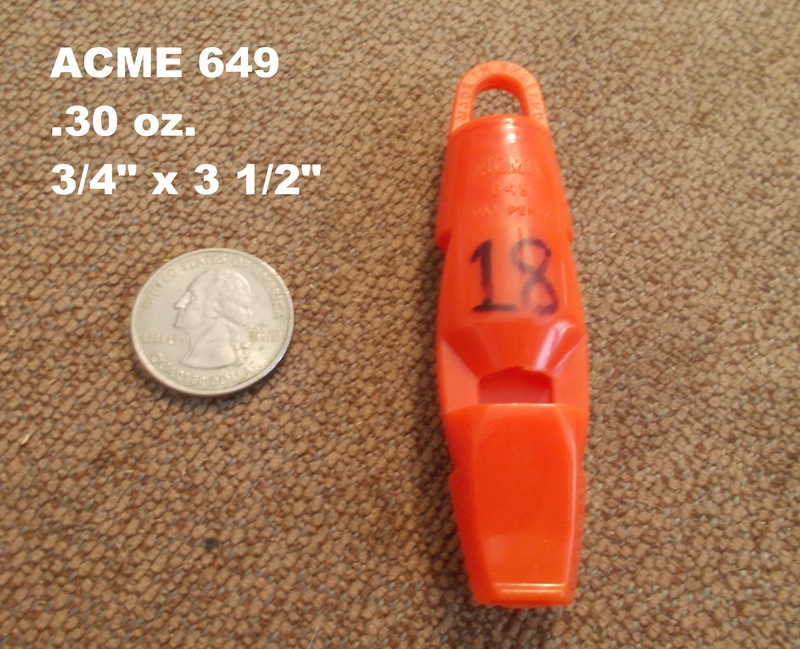 Both low frequency whistles, the Lifejacket and the ACME 649, were heard by Doc Miller up to 3/4 mile away. As stated earlier, even with the use of his hearing aids, he could not hear the other whistles with the exception of the Sharx at 1/4 mile and the Storm up to 1/2 mile. Our testing day would represent ideal conditions. Wind and waves would surely decrease the observed distances. 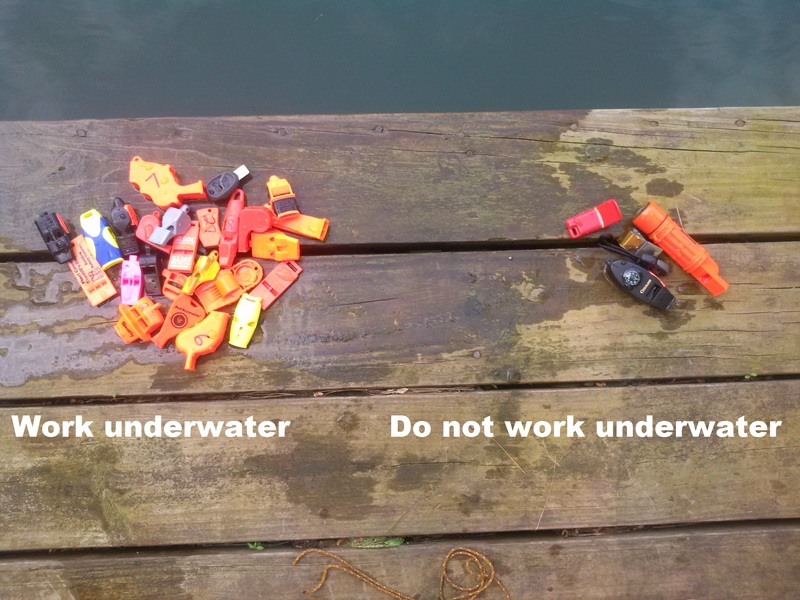 I underestimated the Lifejacket whistle. It is old and ultra cheap, but gave a great showing. 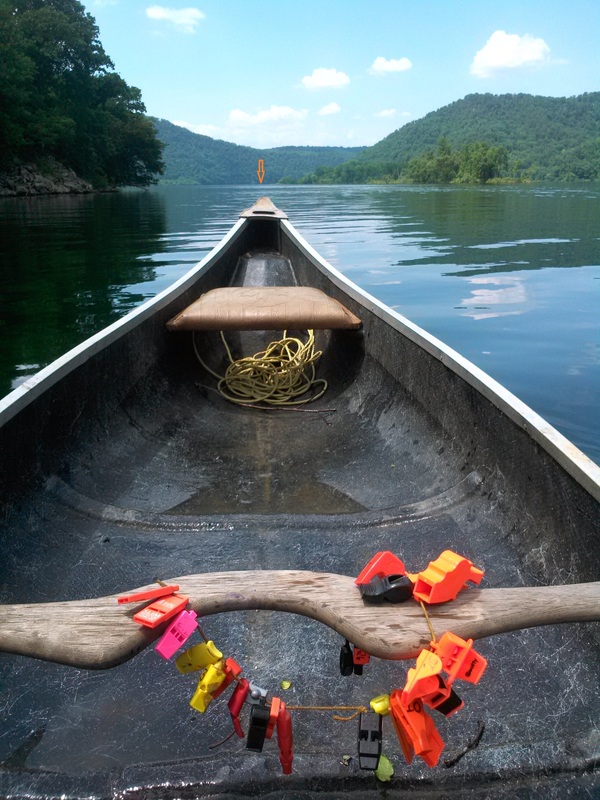 This entry was posted in Gear, Signalling and tagged Blount County Rescue Squad, boater safety, boating, canoeing, fishing, rescue whistles, safety whistles, sailing, search and rescue, signal whistles, signalling, water safety, whistle tests. 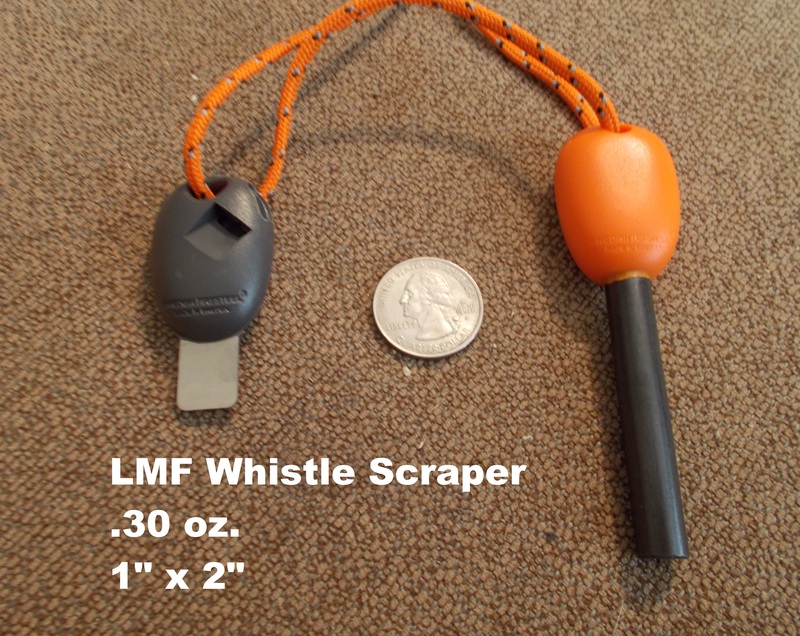 whistle reviews, wilderness survival on July 9, 2014 by bigpigoutdoors. On Sunday afternoon, June 15th, park staff received a 911 call reporting that a woman, hometown unknown, had taken a reported 65-foot tumbling, sliding fall on the snowfield between Chasm Junction and Chasm Lake. Members of the park’s search and rescue team reached the 56-year-old woman early that evening, just two hours after the incident was initially reported. She had numerous injuries. Team members conducted a technical rescue and raised her in a litter back to the snow covered trail. She was carried in a litter to Chasm Meadows and was flown by Flight For Life® Colorado to a hospital in Lakewood, Colorado. 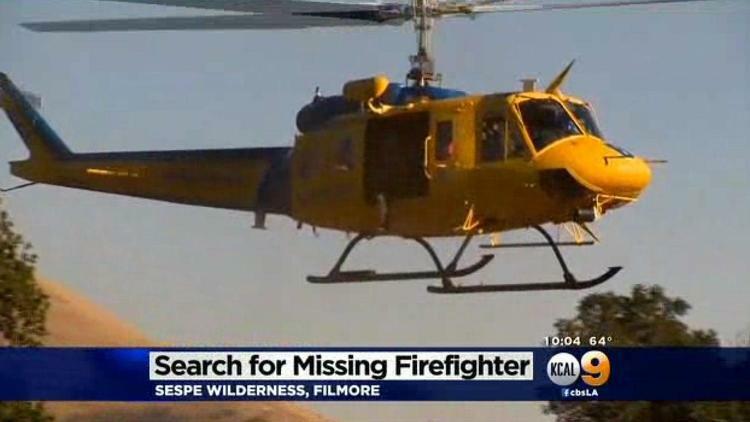 This entry was posted in Search and Rescue, Signalling and tagged firefighter, Kern River, logger, lost, missing, Mt. Whitney, search and rescue, wilderness survival, writer on June 22, 2014 by bigpigoutdoors. Whistlemania is back!! This week we broke out the sound meter to see how loud our whistlers could get. Let me first say that measuring decibels is just one more variable to consider and a loud rating on the sound meter may, or may not, correlate with the distance heard on the ground. 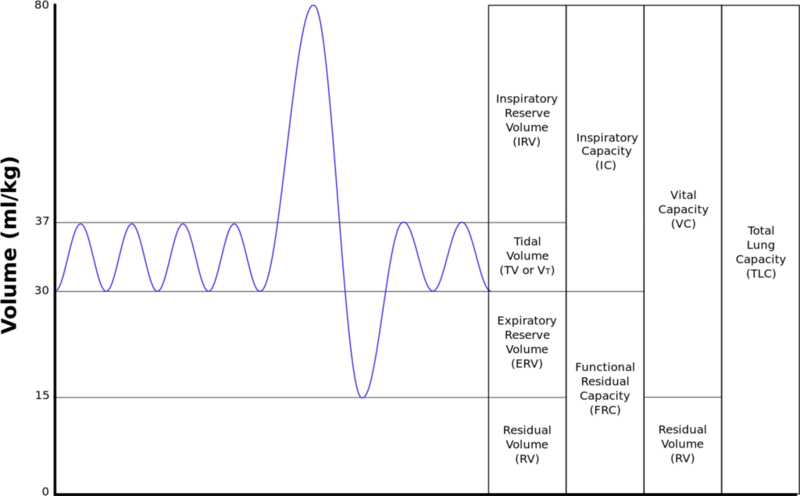 Nevertheless, decibel ratings are often used as a marketing tactic by whistle manufacturers. For the testing I used an Extech SL10 Personal Sound Meter, my lungs, and the lungs of Jake, a 9 year old, athletic boy weighing 67 pounds. 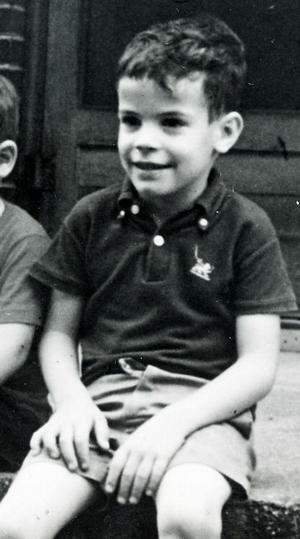 Forty five years ago, on this very weekend, a six year old boy went missing in the Smokies and was never seen again. This tragic story and lessons from the huge search effort helped to shape the search and rescue techniques and protocols of today. A whistle is one of the best items to equip your kids with in the woods, so it makes sense to see which whistles work well for them. Thanks to my pint size partner, we can also extrapolate the effectiveness of each whistle for an adult with a chest injury or condition preventing the full use of the lungs. Last year, I was routed to respond to a hiker that had been pinned under a tree for a day, after a tornado rolled through the park. http://www.local8now.com/news/headlines/Rescuers-work-to-save-53-year-old-hiker-trapped-by-tree-211582431.html. I never made it there, getting redirected to another emergency, but that scenario could easily crush ribs or restrict your lung capacity. Furthermore, COPD, asthma, and a host of other lung ailments restrict the breathing ability of millions each day, so value may be found for them as well. I asked Dr. “Hunk” Miller the ins and outs of lung volumes and this is my lay person understanding. If one were to blow on a whistle, you would use both your Tidal Volume (TV) and your Expiratory Reserve Volume (ERV), which equals out to be 22 ml/kg. Jake, weighing in at 30.5 kg, has around 670 ml of potential air to blow his whistle. That would be the equivalent of a 135 pound person with only one lung or with a chest compressed so it cannot fully expand. If you weigh 135 pounds or more, one could assume that a good performing whistle for Jake would function equally as well if you had an injury that restricted your lung volume or a chronic breathing problem. This is all important if you consider that if you are using your whistle, there is a high chance that your are injured and/or under the effects of adrenaline, potentially affecting your breathing rate and capacity. 2. Decibel level at a distance of 4 feet by a 200 pound adult. Notes on how hard or easy to blow each whistle are in parentheses. Resistance seemed to be the determining factor and can been seen in the duration of the whistle blast in seconds. “Hard”, in this context, means that the whistle provides an amount of resistance greater than the other two categories and does not connote difficultly in use. 3. Decibel level at distance of 4 feet by 67 pound boy. Notes on how hard or easy to blow each whistle are in parentheses based upon Jake’s opinion. I chose 4 feet for tests 2 & 3 because two other field whistle tests were done at this distance and following that standard will allow comparison. 1. Most of Jake’s scores were very close to mine, a few higher, and some a bit lower. This suggests that lung volume to achieve a loud whistle blast is not much of a factor. Jake outperformed me on several whistles and in one of the linked studies, the child routinely got higher scores. 2. I am not a fan of the “Too easy” to blow whistles. The largest difference between Jake and my scores were seen with these and a few of the windier “easy” whistles. A little resistance by design or by a pea, allowed a more efficient use of the expelled breath in my opinion. 3. Some whistles require perfect alignment or placement of lips that could prove challenging under stress or while injured. 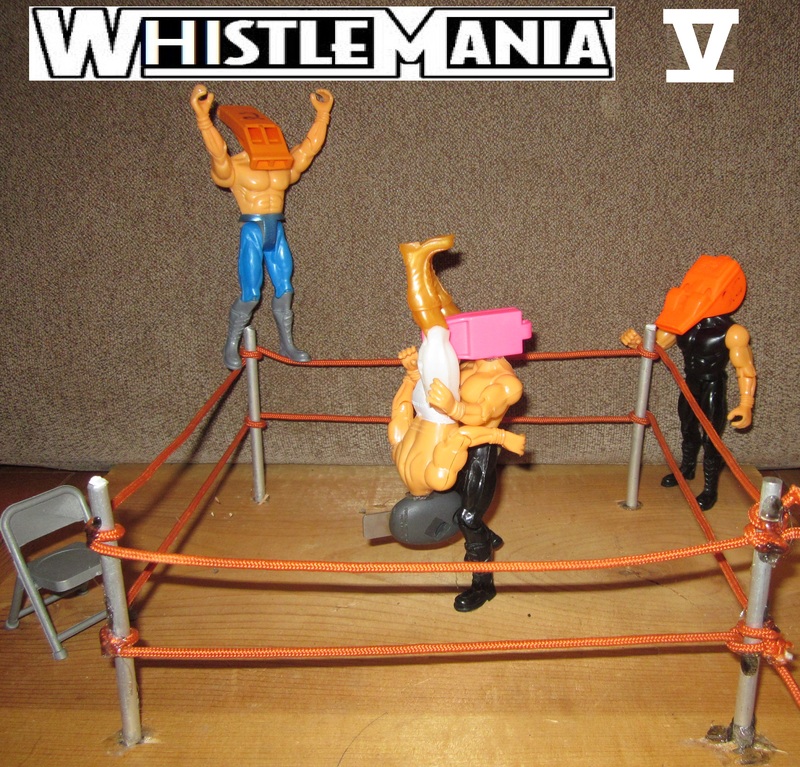 These whistles were also tough for Jake to manipulate, and would therefore be poor choices for little ones. 5. Like I stated earlier, I think decibel ratings are not as important as the distance that a whistle can be heard, which is a factor of loudness, terrain, and frequency. 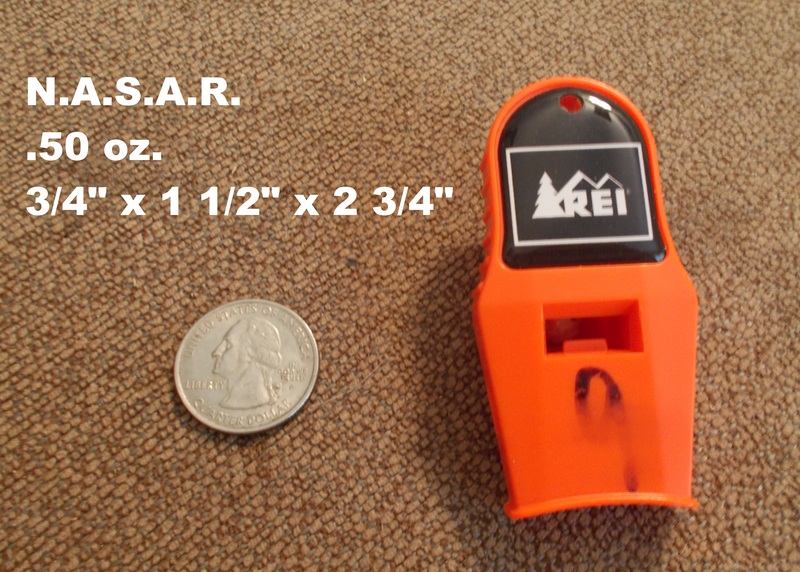 This entry was posted in Gear, Signalling and tagged ACME, backpacking, camping, child safety, Dennis Martin, Fox 40, hammerhead, hiking, lost, rescue whistles, safety, safety whistles, search and rescue, Smokies, storm, whistle review, whistle test, whistle testing, wilderness survival on June 13, 2014 by bigpigoutdoors. If you are a boater, raft guide, lifeguard, sailor, swift water rescuer, or anyone that works around water, this episode is for you. I guess since 70 percent of the earth is covered by water, then this episode is really for everyone. 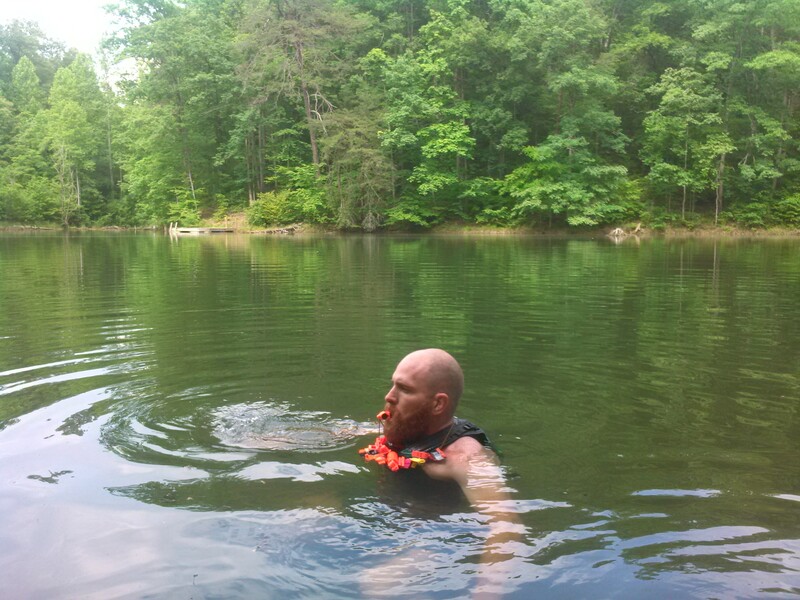 Test 1: I pulled out my life jacket from my old raft guiding days, strapped it on, and went into the drink. The test was simple. 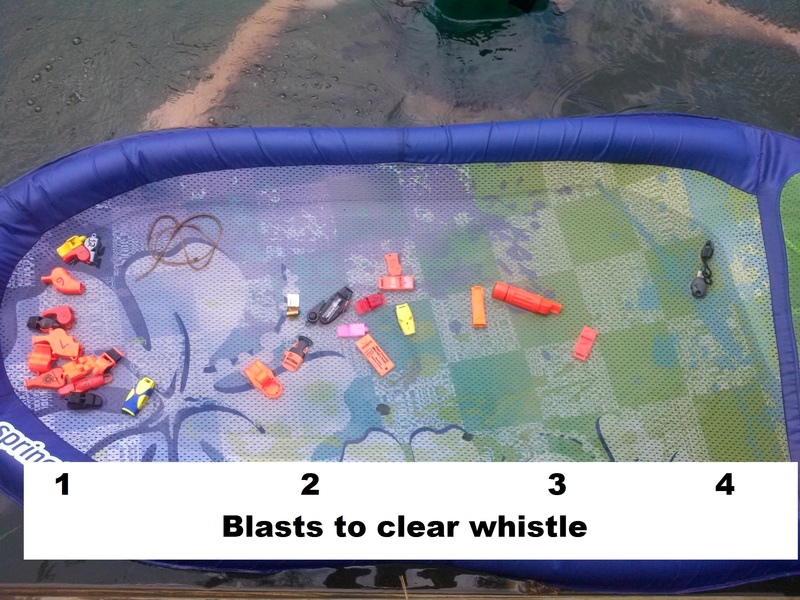 Completely submerge and then see how many blasts it took to clear the whistle of water when I popped up. Test 2: Some manufacturers boast that their whistle floats. I think this is a non issue, since it should be attached to your lifejacket by a lanyard. I tested them anyway. 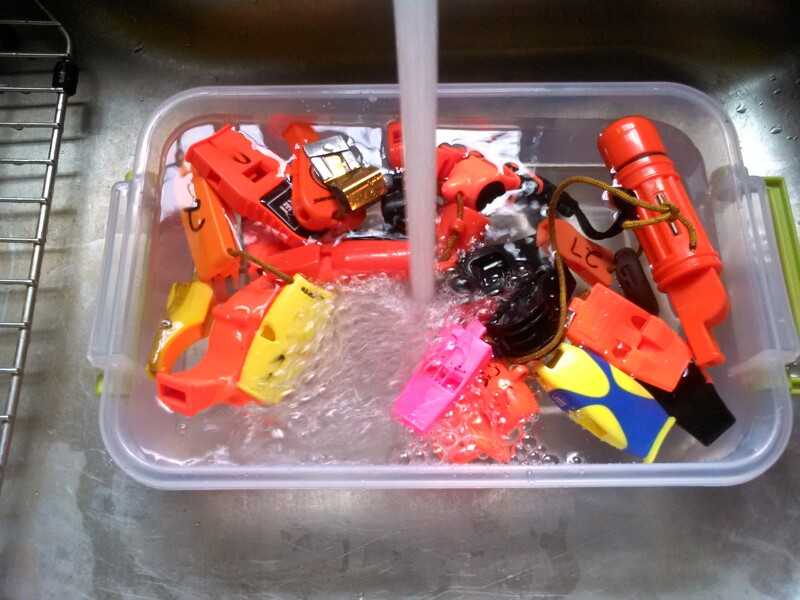 Test 3: Some manufacturers claim their whistles work underwater. I assume this is just boasting about the easy clearance as I am not aware of any practical value of underwater whistle blowing. Anyway, I went under and tried them out. How did they do? Scroll on down to find your pick..
Shame on you if your whistle is not tethered or clipped to your jacket as it could be dropped, swept away by the current, or waves. Both the Storm and the Windstorm did seem to perform best underwater. If you have gills then maybe these are the whistles for you. Tune in next week to see how your pick fares.. 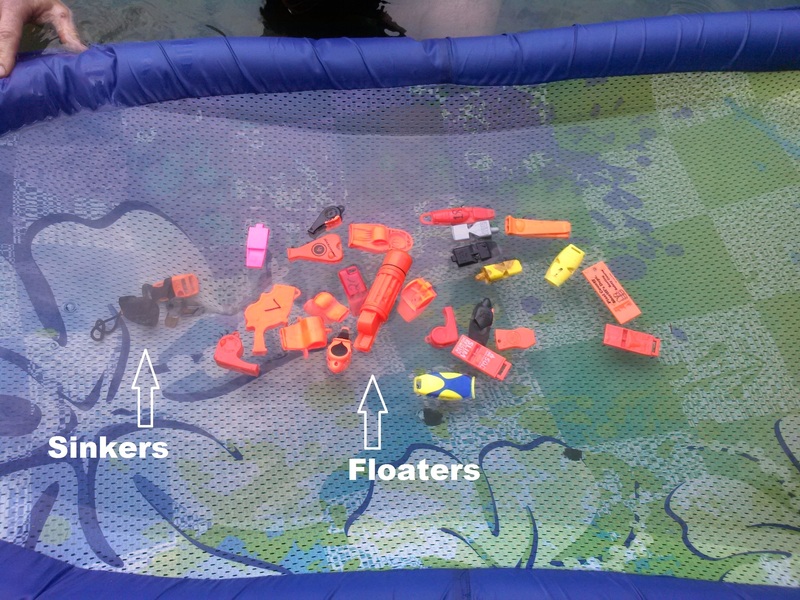 This entry was posted in Gear, Signalling and tagged bushcraft, emergency, lifeguard, rafting, sailing, search and rescue, signal devices, swift water rescue, whistle, whistle review, whistle testing, whistle tests, wilderness survival on May 28, 2014 by bigpigoutdoors. What happens when you hold Whistlemania II in sub-freezing conditions? Carnage.. frozen carnage. Right now it is 59 degrees and raining, so I had to create the sub-freezing arena. First, I gave the Whistlers a good dunking. You may wonder why I didn’t save up and store a quart of saliva for “real-world” testing. I would be lying if I said the thought didn’t cross my mind, but my wife already has enough stories to attest to my grossness without adding any more. I then pulled them out of the water for a quick shake and dumped the water out of the box. 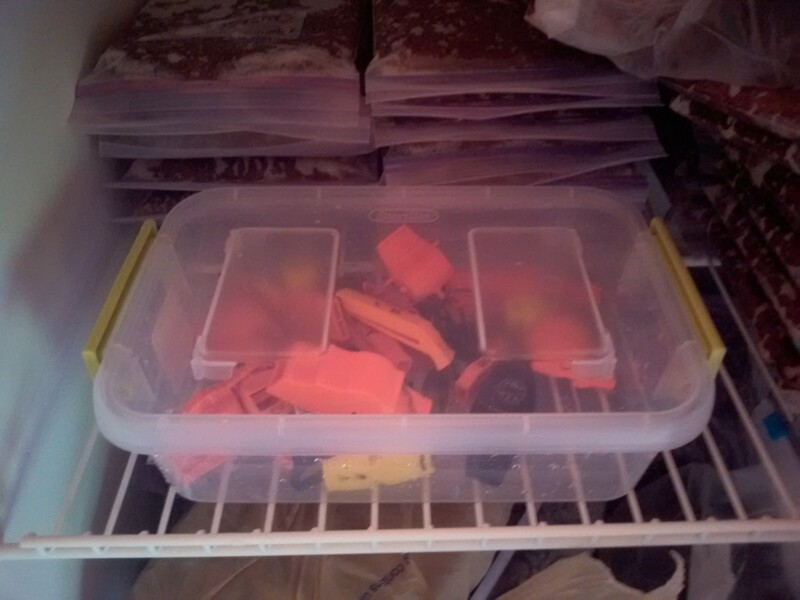 The whistles were then placed in my freezer for two days, rooming next to some deer and hogs. I recognize that this experiment does not exactly replicate coating a whistle with spittle in freezing temps, but it still holds value in my book. In a ways this may be more extreme due to complete immersion. Some manufacturers claim that their whistle does not absorb water..
And another claims their pea to be resistant to freezing.. The Pea whistle has always been flawed – until now. Users have always found the peas in their whistles to jam, freeze, or deteriorate quickly under regular use. This is because the peas that are in standard whistles today are made out of corks – or similar moisture-absorbent materials. The wooden cork peas in conventional pea whistles absorb wet agents, such as saliva and moisture in the air, which in turn creates mold. Hammerhead peas are constructed out of materials that fight mold and bacteria. Myths, marketing, and mayhem, they may be cold, but they’re ready to rumble.. Referee Norm Schachter had a metal whistle freeze to his lips. When he tried to rip it free, it took the skin off his lip, leaving a frozen, bloody lip! Referees then had to simply yell out commands instead of blowing the whistle to end plays. Scotty Lifesaver – Pea froze, but whistle still worked. Failed to blow over 100 decibels. 1. Peas may freeze, but the whistles still worked. All the “frozen pea” whistles blew over 100 decibels at arm’s length on the meter. 2. Tiny air channels hold water that may freeze and cause blockage. ACR, SOL Slim, and the Promo have the tiniest air channels. 3. Carrying your whistle around your neck and under your coat in cold weather should remedy all problems. 4. I have not had a freeze up in actual conditions, nor have I read about any in an outdoor emergency scenario. If you have a first hand account of a whistle freezing up or can link an article, please share your experience in the comment section. This entry was posted in Gear, Signalling and tagged bushcraft, emergency, freezing conditions, safety whistles, search and rescue, whistle, whistle review, whistle testing, whistle tests, wilderness survival on May 15, 2014 by bigpigoutdoors. What in the hell is Whistlemania? 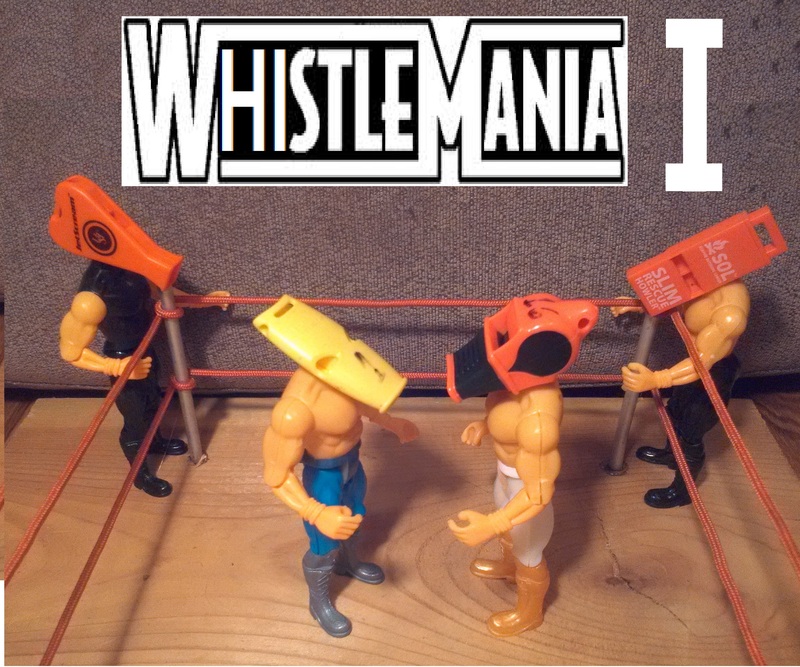 Well, it is the Battle Royal of 30 of the world’s toughest whistles. Back in 1986 at Wrestlemania II, twenty of the world’s strongest, fake wrestlers and NFL players fought it out in a ring to a scripted battle leaving Andre the Giant as winner. 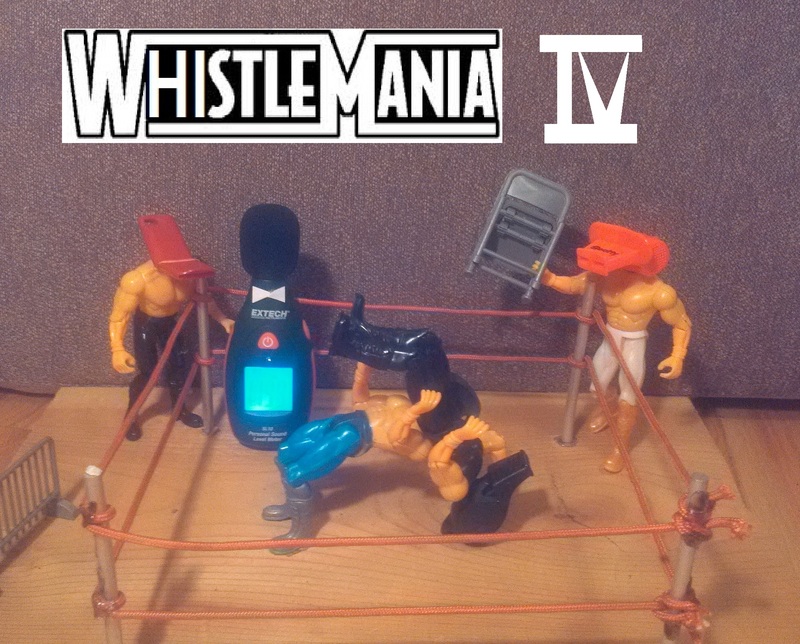 Unlike professional wrestling, Whistlemania pulls no punches, has no script, and no Pay Per View fee!! Before you sound off the nerd alert, let me give you the two-fold back story. First I was looking for a good whistle for my future online store and kids classes, and only the best will do. 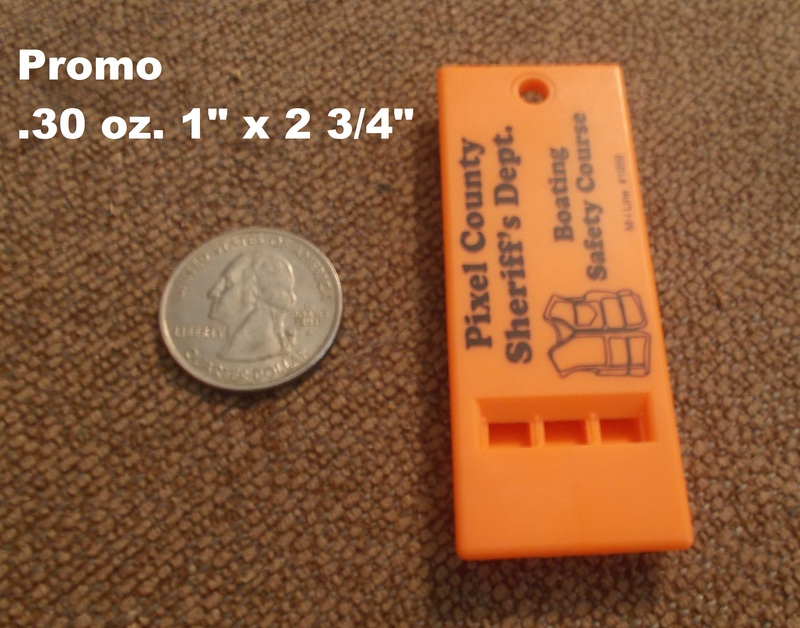 Second, my good friend was looking for an emergency whistle for his kids, so he said.. 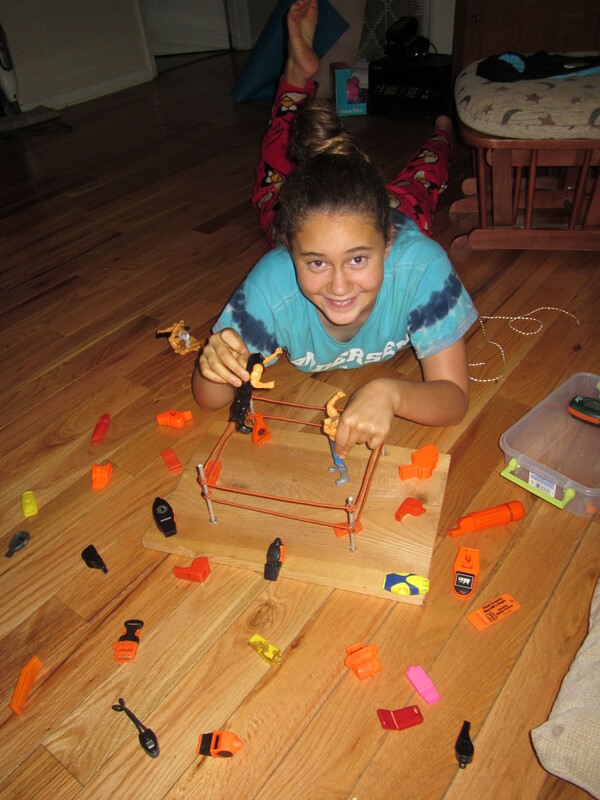 Spurred by noble goals and “Over-The-Top” syndrome, I tapped into my twelve year old, Wrestlemania-watching forebrain to create a 7 part whistle torture test. That’s right, tune into to future posts to watch the drama, and truth, unfold. Yeah, maybe whistles aren’t as cool as AR’s, flashlights, and knives, but one of the most rewarding moments in my career was watching a family be reunited after Rambo Ricky and I found the lost grandparents using whistle blasts in dense vegetation. Whistles work when your voice gives out. They are lightweight, inexpensive, and essential. Whistles save lives. Want to spend a lifetime wallowing in anguish and regret? 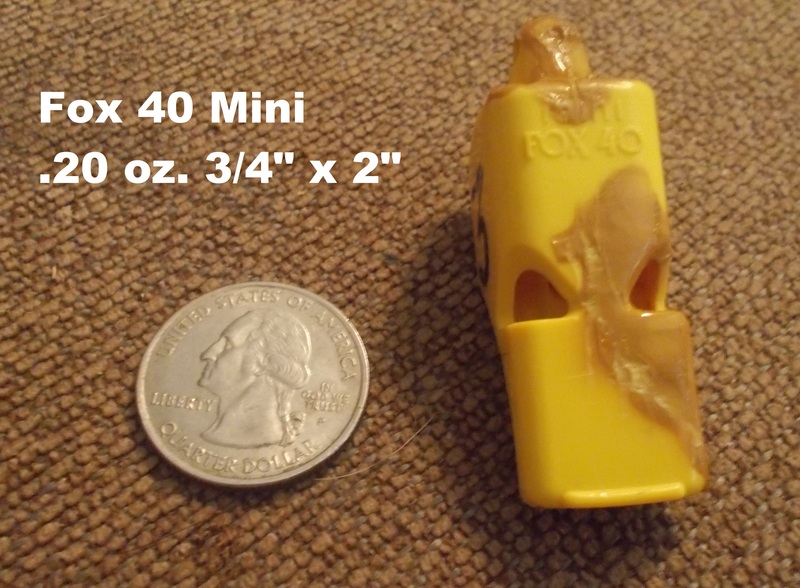 Don’t spend $5 on a whistle for your kids and you may get to if they wander off in the woods. Whistles aren’t just for kids though. Try yelling for help repeatedly and you will soon find out that your voice will give out and you will wish you had a whistle. I carry one every time I hit the woods and usually have a backup version on my sternum strap or neck lanyard. So what is the best whistle? If you said the one you have on you, you are right. Carrying any whistle is better than not, but hopefully this series will sort through the myriad of choices if you are hunting for a new one. 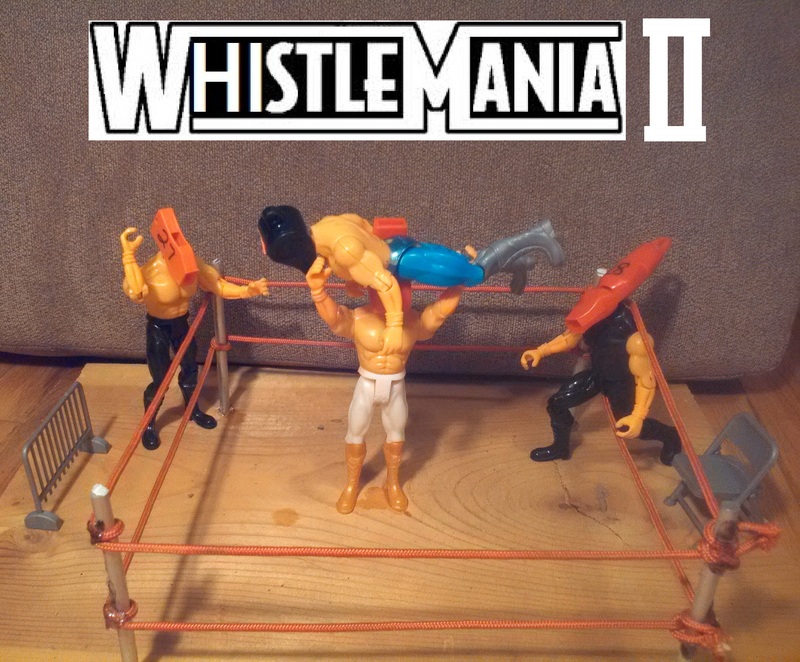 “Whistlemania 1″ will focus on the size, weight, cost, ruggedness, and my general impressions. I only measure length and width on whistles that were slimmer than 1/4” and did not test the expensive titanium whistles because they cost too much for your average woods trekker. There are some other good whistle reviews, and I will link them at the end of the series for inquiring minds. 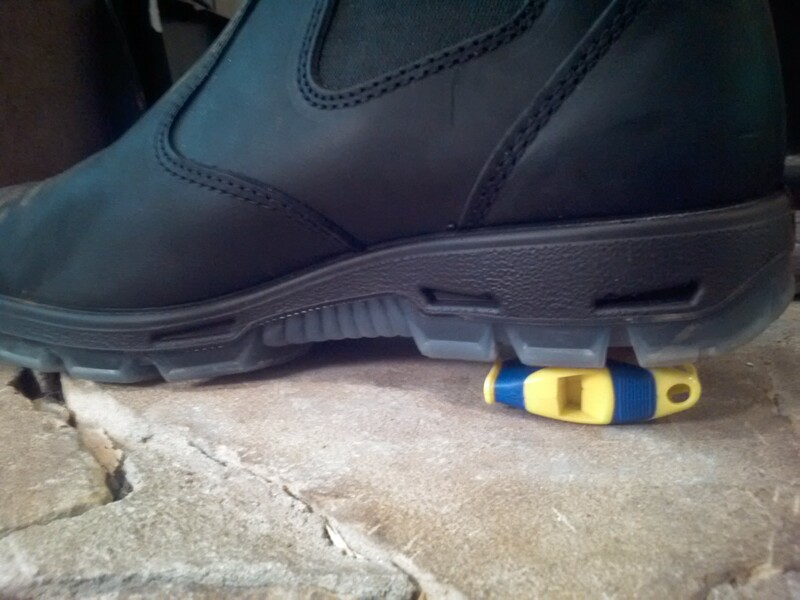 I figured the worst thing that could happen to a whistle in the woods is get stepped on, so the “ruggedness” test consisted of my boot crushing the whistle with all 200 pounds of pressure on a hard surface. 28 out of 30 survived this test and I will showcase those failures at end of this post. Enough talk, time for the show. The contestants are ready for weigh ins, so let’s see the divisions and meet the gladiators.. When I think of “Lightweights”, I think of whistles that I wouldn’t mind having hang around my neck. These would also be the class for smaller PSK’s, Personal Survival Kits., that you carry in a cargo pocket. 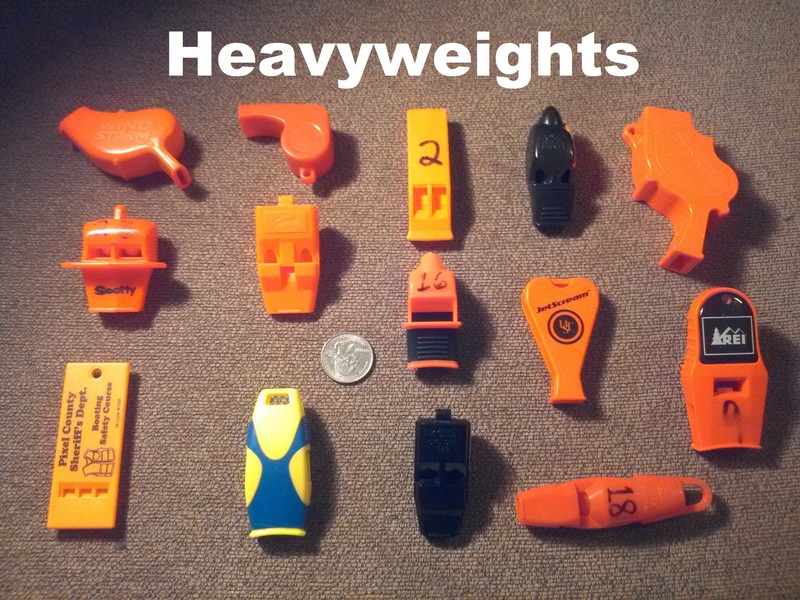 Weight wise, they all weighed in under .30 ounces. Jetscream Micro – Ultimate Survival Technologies. Around $3. Really small. Pealess. 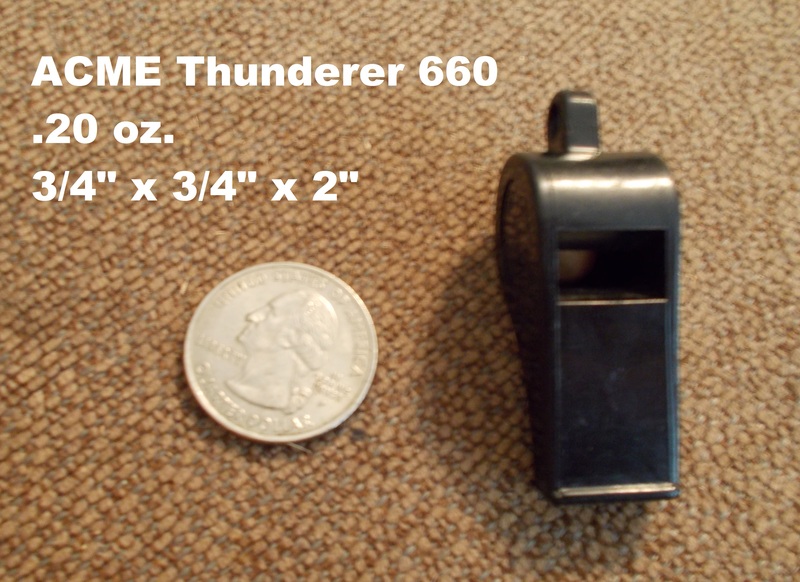 ACME Thunderer 660 – About $6. Has a pea. Has been on my SAR chest pouch for years. 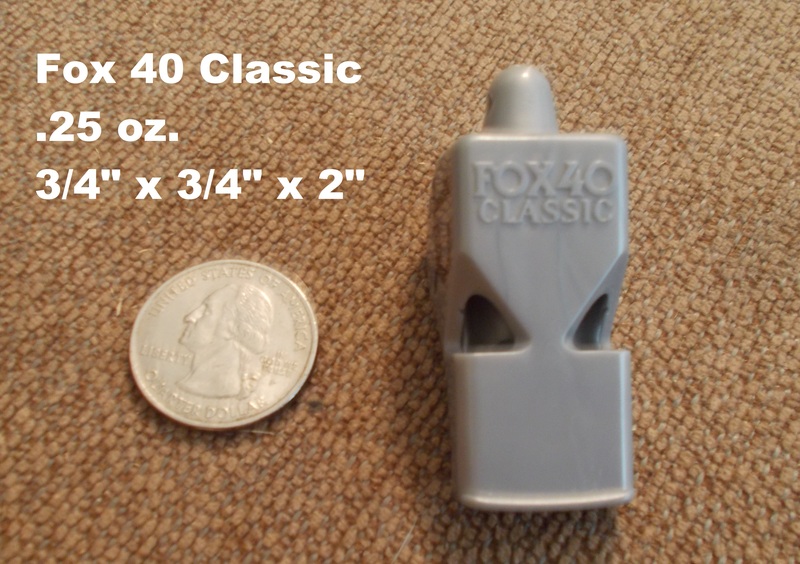 Fox 40 Classic – $6. Pealess. Keels on bottom can be shaved off to give a flatter profile. 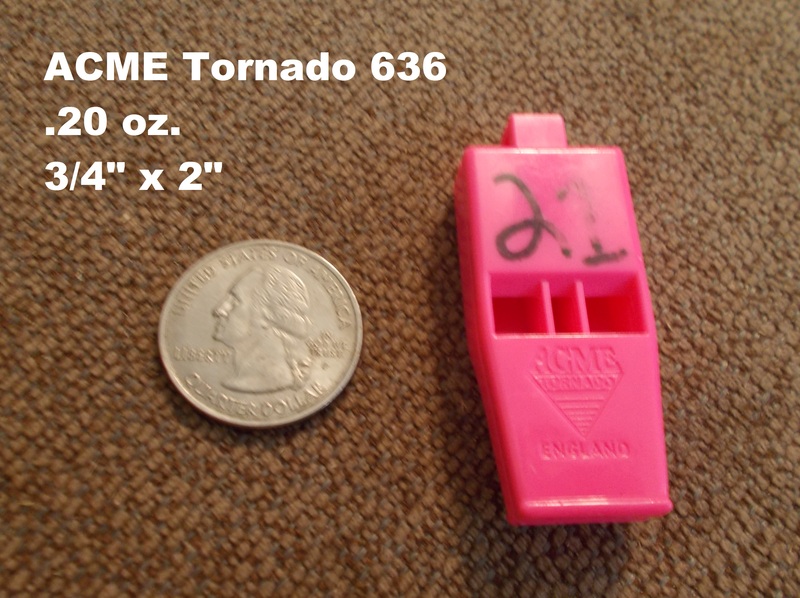 ACME Tornado 635 – $7. Pealess. Non-traditional design. Hammerhead – $4. Has a pea. Unique design projects sound forward. Specialized pea claims to prevent freezing. Tin Whistle – Free. I was first shown how to make these by Mors Kochanski using aluminum flashing. This one was from a can of Rotel and you can also make it from a coke can. I will blog how to do it at the end of this series. I included this one because I have seen people use it for their primary whistle. Fox 40 Mini – $6. Pealess. Smaller than the Classic. I shaved the keels off years ago and I don’t know what the melted goo on it is, maybe pine pitch. At least I hope so. AMK or SOL or Fox 40 Micro – Several names and costing about $8 for a 2-pack. Nice slim whistle. 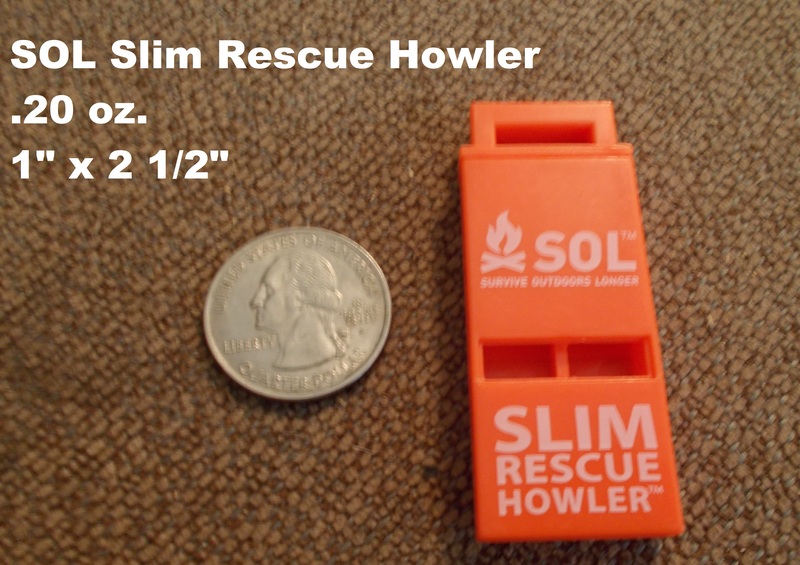 SOL Slim Rescue Howler – $6 for 2. SOL rebrand of the ACR whistle, but tone is a little different. Flat and pealess. No tooth ridge. Next up is the “Multi-purpose” division that boasts whistles as a side benefit or in conjunction with other tools. 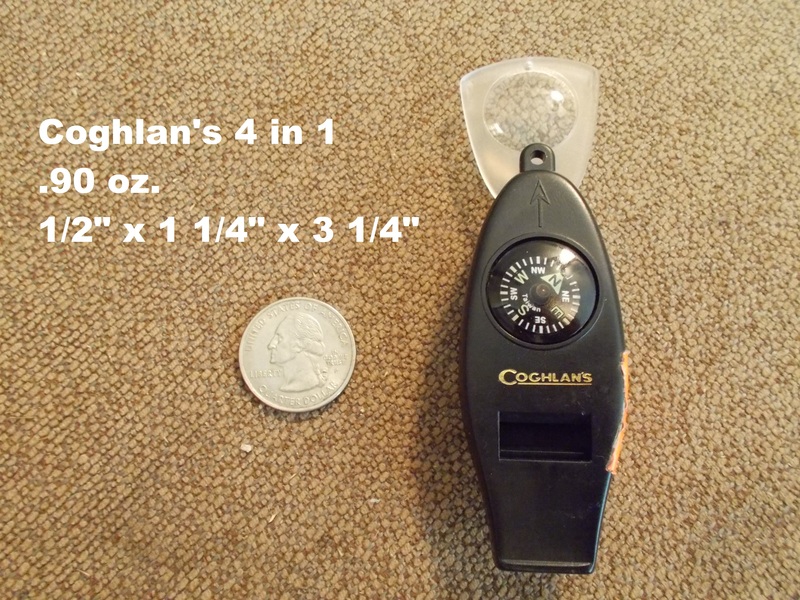 Coghlan’s 5 in 1 Survival Aid – $5. Has a pea. Whistle, compass, mirror, match case, and a ferro rod. I wouldn’t want to count on the ferro rod for a fire, but I did light a cotton ball with it. Zipper Pull Whistle – $5. Pealess. Replaces the zipper pull on your jacket. Coghlan’s 4 in 1 Whistle – $5. Pealess. Whistle, compass, magnifying glass, and thermometer. The magnifying glass is convex on one side and flat on the other. I am no physics geek, but I think that reduces performance. I did manage to light a fire with a piece of punk wood transferred to a tinder bundle. Sternum Strap Whistle – $5. Pealess. 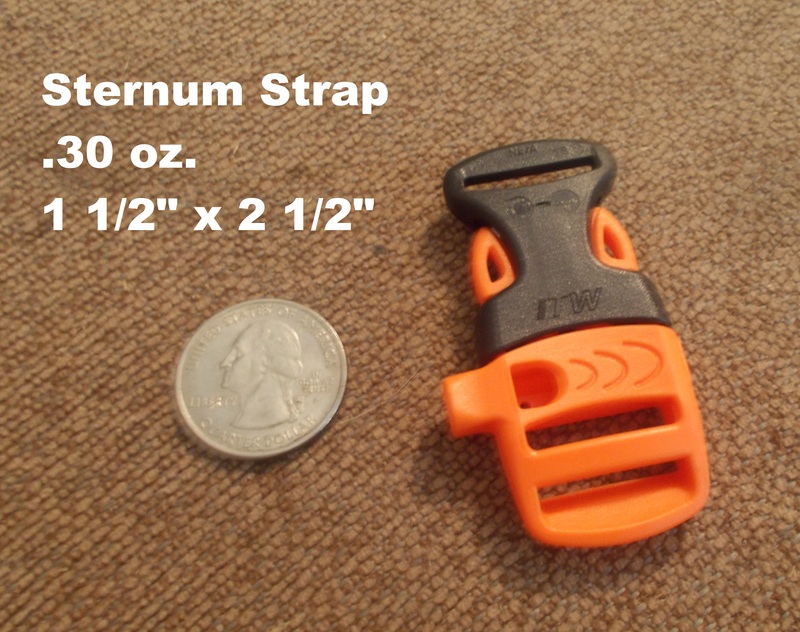 Replaces sternum strap buckle on your backpack. May require sewing to switch out. LMF Swedish Firesteel Army 2.0 – $19. Pealess. Scraper has a built in whistle. I carry this rod on my knife and the scraper on the neck lanyard. The whistle works, but has a sweet spot. Windstorm – $5. 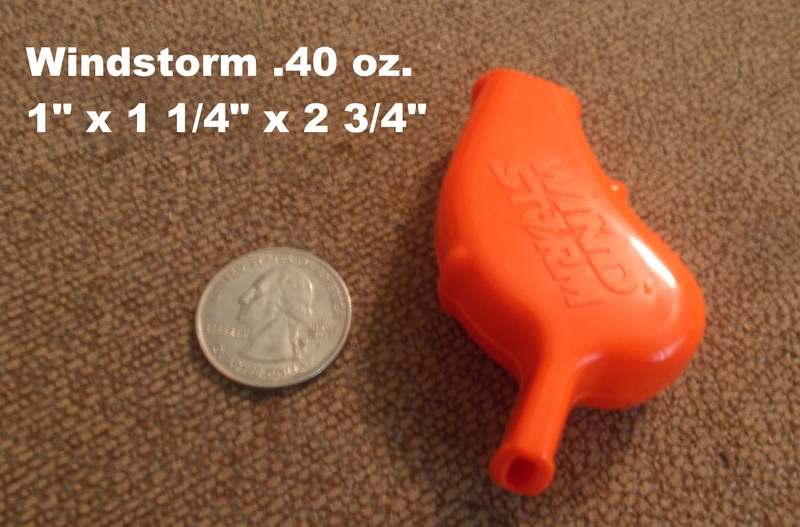 Smaller version of the famous Storm whistle. Has a pea. 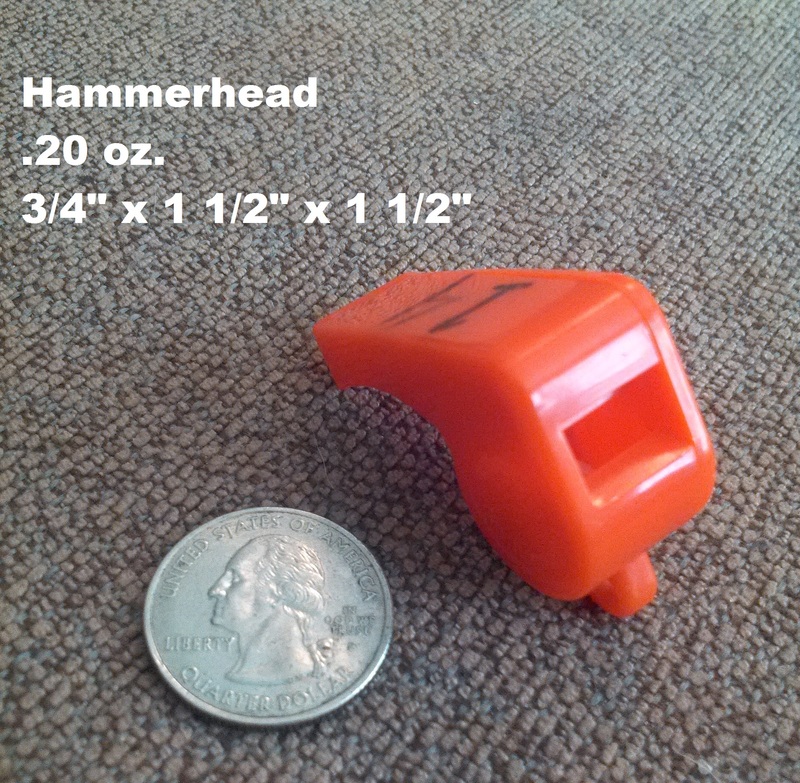 Hammerhead Mighty – $5. Larger version of Hammerhead. Has a “non-freezing” pea and unique design to project sound forward. 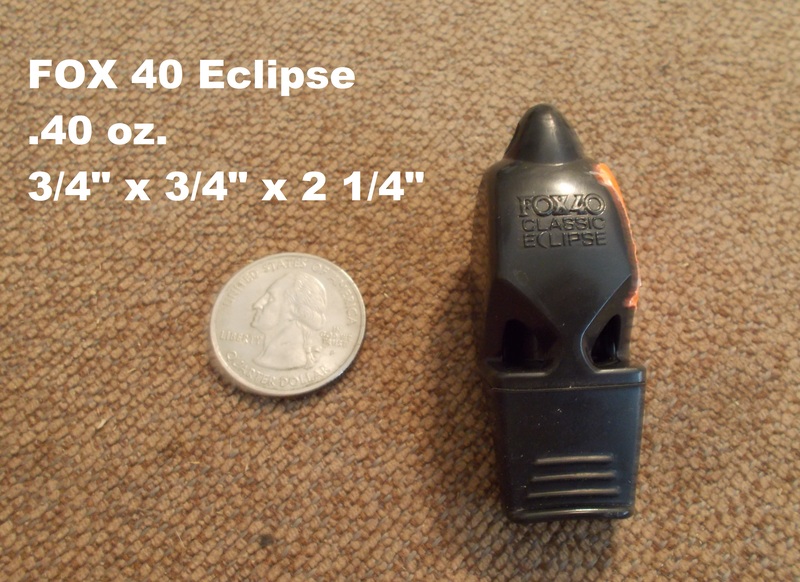 FOX 40 Eclipse – $9. Updated version of the classic. 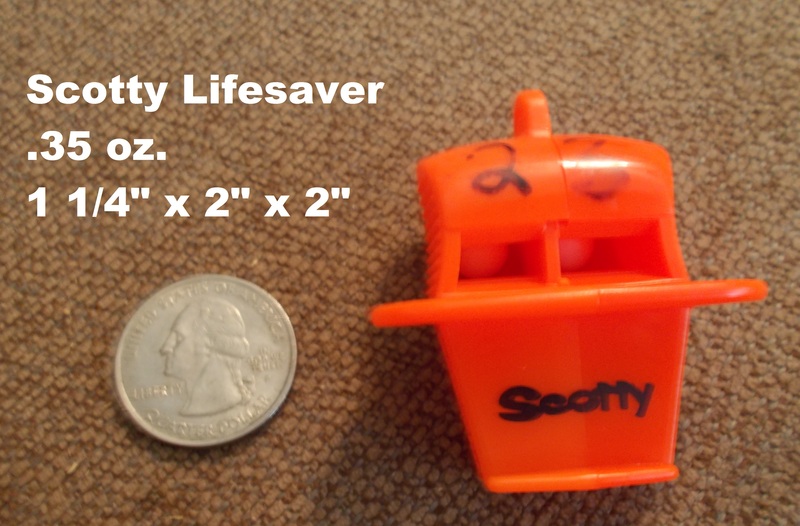 Scotty Lifesaver – $8. Two peas and an anti-choking collar. 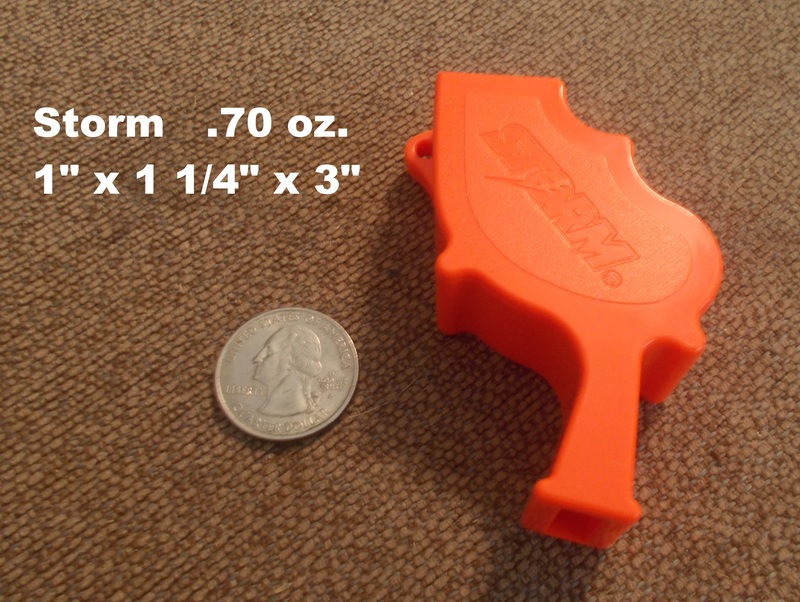 ACME Tornado 2000 – $6. Pealess. Another claimed to be the world’s most powerful whistle. UST Jetscream – $6. Pealess. ACME 649 – $8. Pealess. SOLAS & NATO approved. 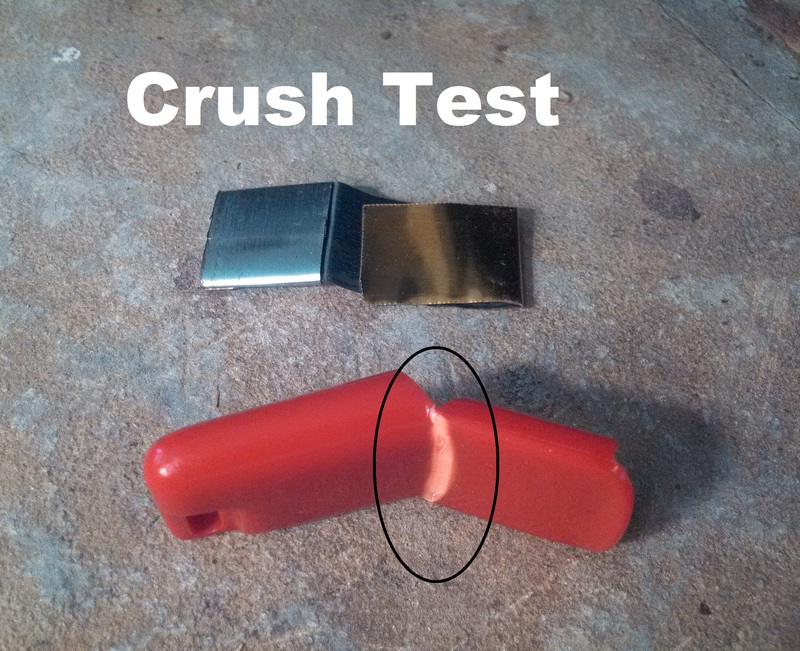 The 2 whistles that failed the crush test were the ACME Tornado 635 and the Tin Whistle, no surprises there. The Tornado still worked after bending it back, but the plastic is obviously stressed and the tone may have changed. The Tin whistle worked after bending it back into shape as well. 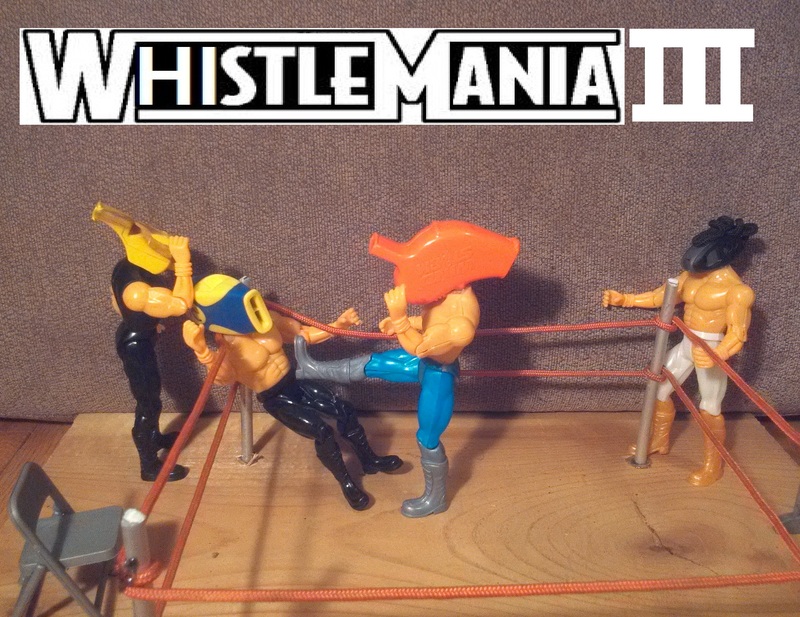 Place your bets ladies and gentlemen and tune in next week for Whistlemania II. 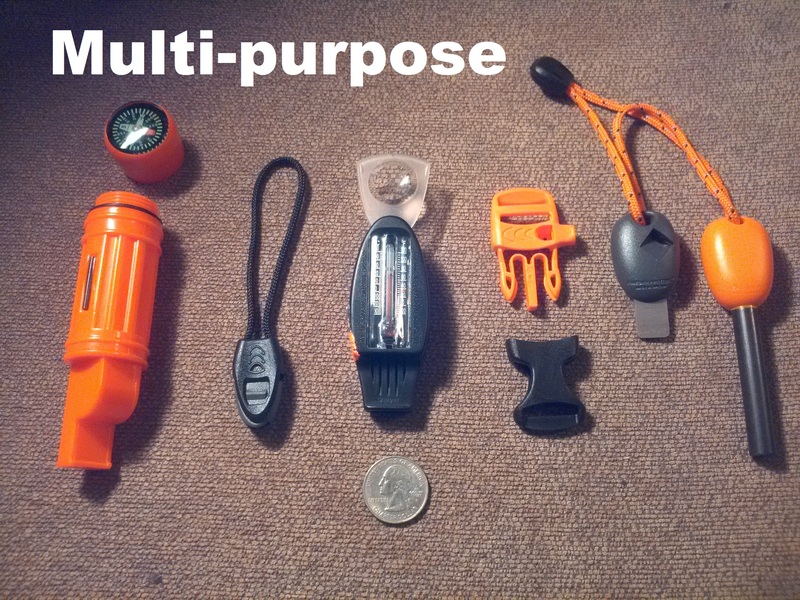 This entry was posted in Gear, Signalling and tagged bushcraft, distress, emergency gear, emergency whistles, lost, safety whistles, search and rescue, signalling, SOLAS, whistle review, whistle test, whistle testing, wilderness survival on May 5, 2014 by bigpigoutdoors. Free Last Minute Stocking Stuffer from BigPig Outdoors!! 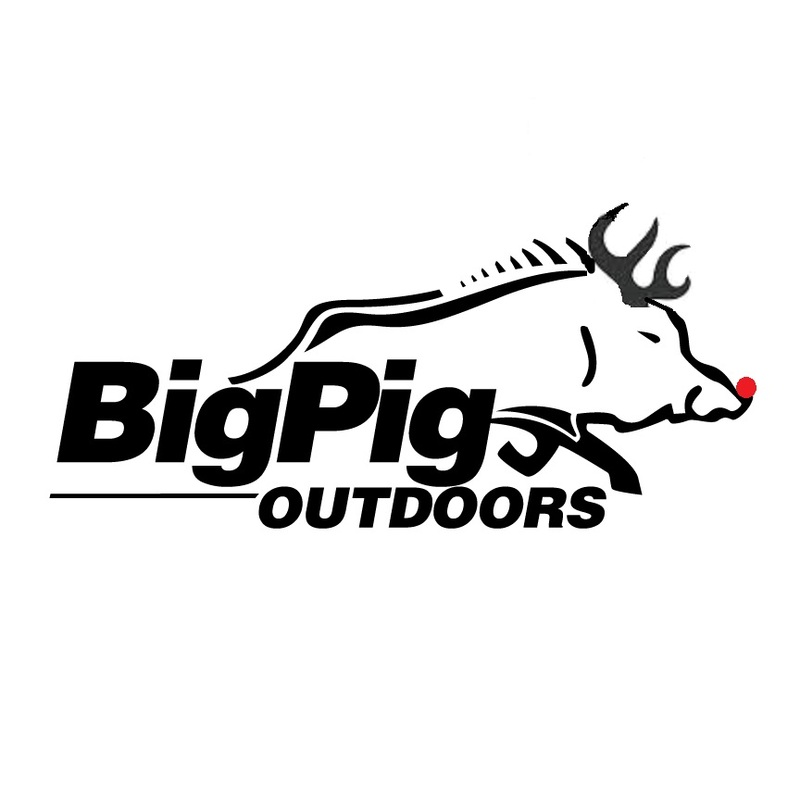 Merry Christmas from BigPig Outdoors!! Need a last minute gift to stuff in your loved one’s stocking? Click below to get the best signalling device that needs no batteries, no cell service, and weighs only a couple grams. This entry was posted in Signalling and tagged bushcraft, signalling, trip plan, wilderness survival on December 25, 2013 by bigpigoutdoors.